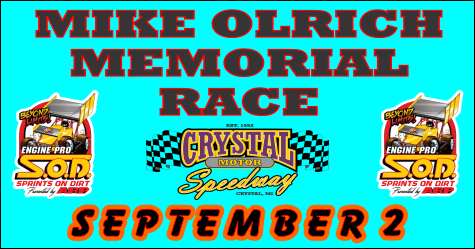 The 4th annual Mike Olrich Memorial Race is this Saturday, September 2nd at Crystal Motor Speedway. 2017 was SOD’s 38th consecutive season at the speedway. The race will be the final points race of the Engine Pro Sprints On Dirt presented by ARP season. Currently, Steve Irwin (Fenton, MI) holds the SOD Championship point lead over Thomas Schinderle and Gregg Dalman. The SOD champion will have a guaranteed starting position in SOD’s season finale, the COMP Cams Great Lakes Sprint Car Classic at Berlin Raceway on September 30th. The 30 lap Mike Olrich Memorial Race will honor the memory of former Sprints On Dirt official and series director Mike Olrich who was very congenial and well-liked by everyone in the series. Professionally, Mike was a greenhouse researcher at Michigan State University. His work lives on through a complex computer-based tool that he co-authored that provides assistance to flower growers in production scheduling. Mike was a dedicated family man who always found time to be deeply involved coaching youth sports. Michael Steven Olrich, passed away suddenly August 3, 2013, at the age of 43. SOD continues to operate with the honesty and integrity Mike was known for, and honors him every year with the Mike Olrich Memorial Race. Ryan Ruhl drove his 360-powered #16 to a decisive win last year, leading all 30 laps of the non-stop feature in front of a very large and enthusiastic crowd. Ruhl also won the 2015 Mike Olrich Memorial. Ohio’s Randy Hannagan won the 2014 Mike Olrich Memorial. Check out www.enginepro.com, and ARP at www.arp-bolts.com. 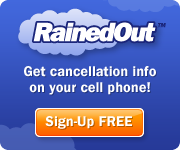 For Sprints on Dirt points, events, rules, current news, and other information go to www.sprintsondirt.com. 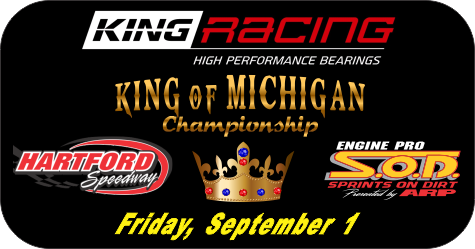 This Friday, September 1, Engine Pro Sprints On Dirt presented by ARP makes its last appearance of the season at Hartford Speedway for the King Engine Bearing King of Michigan Championship. The King of Michigan, a SOD tradition as a single race before 2017, was expanded to include all four 2017 SOD races at Hartford Speedway. The always-popular King Engine Bearings King of Michigan returned bigger and better with heightened excitement about the four-race format and the newly reconfigured 3/8 mile track. Litchfield, Michigan’s Chad Blonde has dominated the series, winning all three KoM races run this season. Blonde leads Steve Irwin, Gregg Dalman, Thomas Schinderle, and Linden Jones in points. The 2017 champion will be crowned Friday, and will receive $1,000; the top five will win a share of the point fund. In addition, the champion will have a guaranteed starting spot in the Engine Pro Sprints On Dirt presented by ARP Mike Olrich Memorial Race at Crystal Motor Speedway on September 2nd, along with MAHLE/Clevite Beyond Limits Champion Steve Irwin and Driven Racing Oil Battlegrounds Bash Champion Thomas Schinderle. For more information about SOD’s KoM series sponsor partner, go to www.kingbearings.com. Check out Hartford Speedway at www.hartfordspeedway.net for more information about the speedway. Steve Irwin (Fenton, MI) is the 2017 Engine Pro Sprints On Dirt presented by ARP MAHLE/Clevite Beyond Limits Challenge champion. The four-race Challenge had four different winners with Irwin finishing in the top five in all four races to take the championship. The MAHLE/Clevite BLC was scheduled for five different speedways; Baer Field Motorsports Park, Thunderbird Raceway, Merritt Speedway, Crystal Motor Speedway, and Manistee County Fairgrounds Speedway. The final scheduled BLC race at Manistee was rained out on August 4th, and the make-up date of August 18th also fell victim to inclement weather. Shawn Valenti (Delta, OH) took the first BLC race at Baer Field Motorsports Part on May 21st after an exciting battle with Joe Swanson. Irwin finished 5th. Chad Blonde took race #2 at Thunderbird Raceway on June 10th with a last lap pass of Thomas Schinderle. Irwin finished 3rd. Ryan Ruhl won the 3rd BLC race at Merritt Speedway on July 8th. Brad Lamberson finished 2nd, Gregg Dalman 3rd, Mike Astrauskas 4th, and Irwin 5th. The 4th race, at Crystal Motor Speedway on July 15th, was just what Irwin needed. He drove to a convincing win on one of his favorite speedways over Thomas Schinderle and Shawn Valenti. 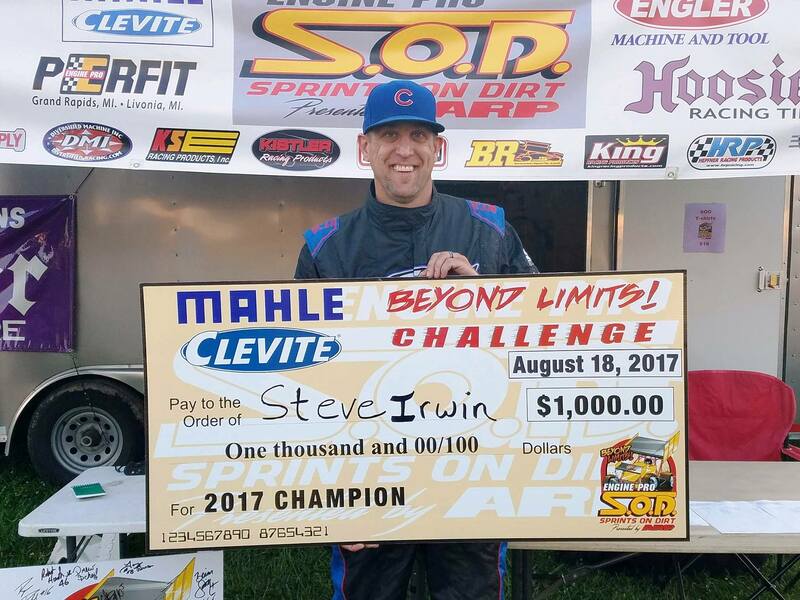 Irwin collected $1,000 for winning the MAHLE/Clevite Beyond Limits Challenge championship. Thomas Schinderle (2nd), Gregg Dalman (3rd), Chris Jones (4th), and Robert Bulloch (5th) also shared in the point fund. Irwin is now guaranteed a starting spot in the Mike Olrich Memorial Race at Crystal Motor Speedway on September 2nd. MAHLE Original is the “Global Star” within the MAHLE Aftermarket brand portfolio. The brand MAHLE stands for engine parts, filters, thermo management and mechatronics of uncompromising quality – in original equipment and aftermarket. Clevite is an American brand with one of the oldest pedigrees and supplies pistons, assemblies, cylinder liners, bearings and valves for American commercial vehicles as well as construction and agricultural equipment applications. Competitors may debate who is the best on the track, but under the hood, there is no debate that Clevite and MAHLE are the one constant of winning teams throughout American grass roots racing. For more information about MAHLE/Clevite, click HERE. Meet Engine Pro go to www.enginepro.com. For more information about ARP, go to www.arp-bolts.com. The full 2017 Sprints on Dirt schedule, rules, current news, and other information are available at www.sprintsondirt.com. Thomas Schinderle (Berkley, MI) put together top five finishes in all three 2017 Engine Pro Sprints On Dirt presented by ARP races at Butler Motor Speedway to take the Driven Racing Oil Battlegrounds Bash championship. Schinderle followed Chad Blonde and Ryan Ruhl to finish 3rd on June 17 at Butler. On July 22, Schinderle had his worst Bash finish, 5th, behind winner Joe Swanson, Jay Steinebach, Ryan Ruhl, and Boston Mead. Parked in 4th place in Bash points going into the finale, the 4th annual Butler Bash, on August 12th, Schinderle didn’t seem to be in a good position to take the championship. That didn’t faze him, though, as he charged to the win from 6th after an exciting, crowd-pleasing battle with Joe Swanson. Schinderle took the $1,000-to-win championship with 410 points. Joe Swanson (388) finished 2nd followed by Chad Blonde (385), Jay Steinebach (367), and Steve Irwin (366), winning a share of the point fund. 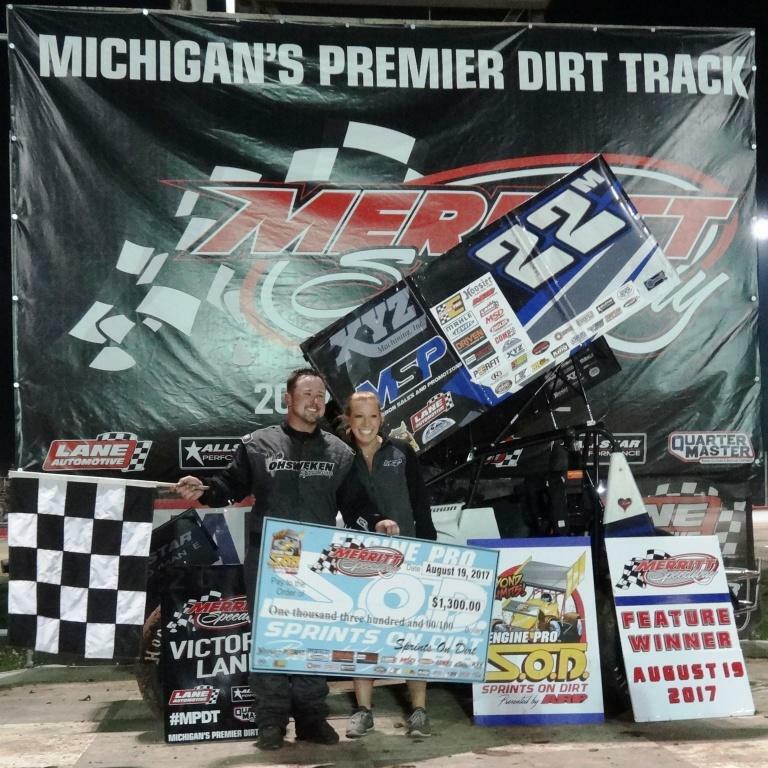 As the Driven Racing Oil Battlegrounds Bash champion, Schinderle now has a guaranteed starting spot in the Engine Pro Sprints On Dirt presented by ARP Mike Olrich Memorial Race at Crystal Motor Speedway on September 2. Schinderle is currently 2nd in SOD championship points. He also leads the Sprints On Dirt Series Rookie of the Year standings for drivers with full size sprint car experience, but are first-year full time competitors with SOD. Driven Racing Oil shares the same leadership spirit in the highly competitive field of racing lubricants that drives SOD in sprint car racing. Engine Pro Sprints On Dirt presented by ARP is proud to have Driven Racing Oil partner with SOD for 2017. No oil is tested in competition like Driven Racing Oil, and no oil that you can buy has proven itself in Victory Lane like Driven Racing Oil. That’s a track record of a leader that you can believe in. The Driven Racing Oil Battlegrounds Bash series, along with the King Engine Bearings King of Michigan series and the MAHLE/Clevite Beyond Limits challenge gave competitors an opportunity to focus on mini-championships and payouts during the pursuit of the full Engine Pro Sprints On Dirt presented by ARP 2017 season championship. Read more about Driven Racing Oil at http://www.drivenracingoil.com. For more information about Butler Motor Speedway, go to www.butlerspeedway.net. “Danny Mac” started second, but was moved back one row for jumping the start. All that did was give him a chance to prove he was the class of the field as he took the lead on lap nine. Thirteen-year-old Andrew Scheid (Sparta, MI), leading SOD sprint car rookie, started on the pole and led the first lap before Gregg Dalman (Bellevue, MI) grabbed the lead. After McCarron took command, Dalman held second until lap sixteen when Steve Irwin (Fenton, MI) took the position. At times, it looked like Irwin had the speed in the low groove to overtake McCarron, but McCarron was up to the task and used the middle groove to perfection to pull away. Lap eighteen saw a quick caution for a spin by Tyler Bearden , then disaster struck for Chris Jones when he flipped while trying to evade a spinning Mike Burkin. Ryan Ruhl and Thomas Schinderle also looked like they could challenge for the win, but finished third and fourth respectively. 2016 SOD champion Brian Smith finished fifth. Steve Irwin did double duty and won the non-winged portion of the Allstar Performance Open Wheel Spectacular over Brian Smith.